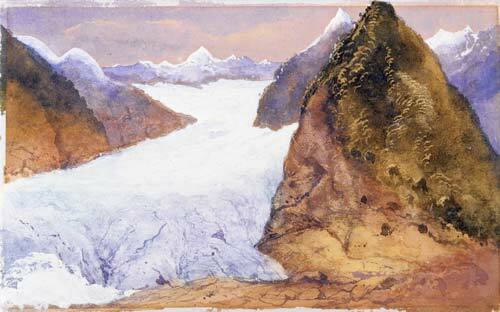 This watercolour of the lower end of the Fox Glacier was painted by Sir William Fox, who was premier when he visited in 1872. Originally called the Albert and/or Alfred Glacier, it was renamed after Fox to honour him. Since then most glaciers have melted considerably, and the Fox has thinned and retreated up the valley.